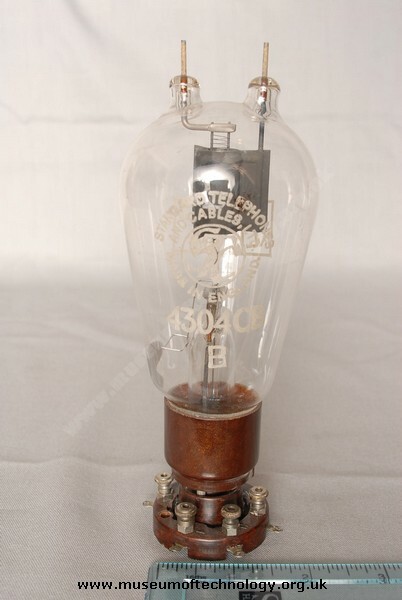 The Marconi Osram Valve Company developed the DET12 in 1939 a Triode of up to 50 Watts for Microwave frequencies in pulsed Radar down to 1 metre, an unusual valve as both the grid and anode is taken out from the top wires. It also found favour in early developments of VHF wireless transmitters for police use. Sergeant Octaloni of the Manchester Police was a regular visitor to the MOV Factory on this project in the years before the Second World War. The valve was used as the transmitter in the base station. A pair of prototypes were used in the A1 Radar transmitter developed at Bawdsey Manor, and the T1131 Ground to Air Transmitter.